We use our eyes in virtually everything we do, and we depend on our vision to steer us through our daily lives. The eye allows us to see the shapes, colors and dimensions of objects by processing the light they reflect or give off. The anatomy of the eye allows humans to see in dim light or bright light, but not in the absence of light. The eye changes light rays into electrical signals and then sends the signals to the brain. The brain interprets these electrical signals as visual images. The eye measures approximately one inch in diameter and is set in a protective cone-shaped cavity in the skull called the orbit or socket. The orbit is surrounded by layers of soft, fatty tissue that protect the eye and allow it to turn easily. Six muscles regulate the motion of the eye. Among the more important parts of the anatomy of the human eye are the cornea, conjunctiva, iris, lens, retina, macula and the optic nerve. The cornea is sometimes referred to as the "window of the eye." It provides most of the focusing power when light enters your eye. The cornea is composed of five layers of tissue. The outer layer is the epithelium. This layer is made up of highly regenerative cells that allows for fast healing of superficial injuries. The two middle layers of the cornea provide strength, shape and structural stability to the eye. The two inside layers work to keep fluid out of the cornea and maintain its optical clarity. LASIK laser vision correction is performed on this part of the eye. The lens is the clear structure located behind the iris. Its primary function is to provide fine-tuned focusing for near vision. The lens performs this function by altering its shape to become thinner or thicker as necessary. Between the ages of 40 and 50, the lens becomes less flexible and presbyopia sets in. As people reach their 60s or 70s, the lens can become cloudy and hard (cataract formation), preventing light from entering the eye. The pupil is the hole in the center of your iris (the colored part of your eye). The primary function of the pupil is to control the amount of light entering your eye. When you are in a bright environment, the iris constricts, causing the pupil to become smaller to allow less light to pass through. When it is dark, the pupil expands to allow more light to reach the back of your eye. The iris provides the color of the eye (i.e. blue/green/brown/hazel). The iris’ main role is to control the size of the pupil through contraction or expansion. This is the clear, gel-like substance located inside the eye's cavity. The purpose of the vitreous body is to provide a spherical shape to the eye. The vitreous may develop small clumps known as floaters. These are more common in nearsighted people than in the rest of the population. 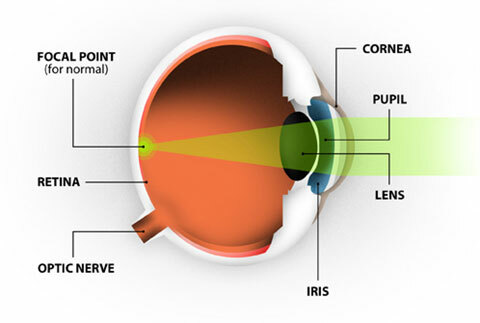 The retina consists of fine nerve tissue that lines the inside wall of the eye and acts like the film in a camera. Its primary function is to transmit images to the brain. When your vision is perfect, the light rays coming into your eye focus precisely on this part of your eye. The optic nerve carries electrical signals from the retina to the brain.